OLINDA HASSAN examines the social divide between Bangla and English-medium students. The growing availability of English medium education in Bangladesh attests to the increasing demand for the global language, both domestically and internationally. Even traditional, national-curriculum following Bangla medium schools, such as Viqarunnisa Noon School or St. Josephs have established “English medium” sections. These sections teach the basic national curriculum as translated in English, and usually have only one Bangla class, for at most 45 minutes per day. In the O'level exams in English medium schools, the Bangla section is easily passable, as discussed by several alums of such schools for this article. “Since Bangla is taught as a second language, the section is fairly easy, and almost everyone will score an A,” explained a graduate from Sunbeams. 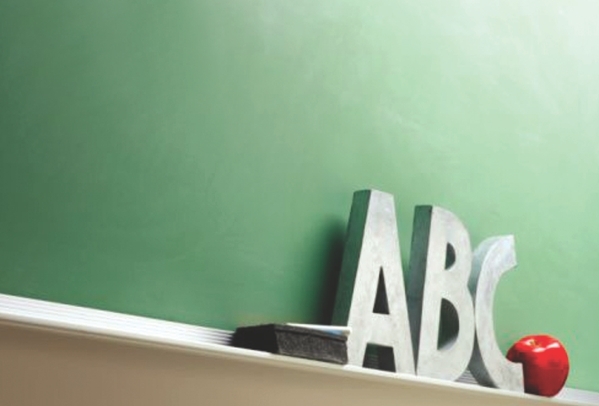 This trend, along with the rise in British-curriculum English medium schools in the country, attests to the language's continued prestige in the region. The rise in the usage of English, beyond schools and corporations, testifies to the effect of globalisation in Bangladesh. As the country promotes foreign investors, for example, the importance of having proficient English becomes crucial, for everyone. Since the mid-20th century, or when independent nations started forming from colonialism, English-based educational institutions started to flourish in order to speed up the process of development; in Bangladesh, the rise in such schools was concurrent with the liberalisation of the market and flowing international aid. In Bangladesh and around the world today, governments are increasingly making English classes compulsory at younger ages, though often without providing the necessary funding for training teachers and for teaching material. The rise in English has also created a cultural change, especially in urban areas; complete fluency of the language has become a new medium for defining social hierarchies at a very early age. English has become the tool to eliminate people from inner circles; at schools, the work place, to neighborhoods, etc. The extensive trust in the power of English is causing many to hold a negative image of their own language. It has also raised another interesting question -- what will happen to the Bangla language itself as more parents and children are picking English as the mode for life instruction? From being under British to Pakistani rule, Bangladesh has gone through a vastly emotional language movement, fighting for its right to use Bangla. Today, such a history is compounded with English becoming the preferred language of elitism, intellect, as well as the venue for the nation's development. “We don't really talk to them in the Bangla medium section, they are not like us,” said one student in Class 8 who studies at the English medium section at Rajuk Uttara Model College (RUMC). He is wearing green, the colour that distinguishes him from the Bangla medium students who wear blue at RUMC. While he is sharing the same school grounds as the hundreds of others in Bangla medium, it is notable that the two sections often do not mix socially. If one looks out at the playing field, the greens and blues can often be seen in dividing clusters during breaks. Yet the two sections have combined to make RUMC stand at the first place in rankings yet again, scoring at the top in the recent national SSC exams. 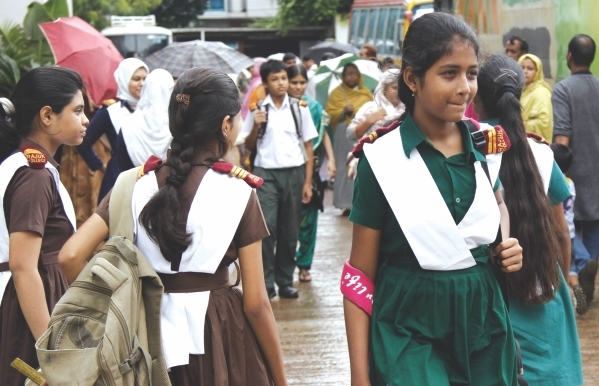 The national-curriculum following schools also have vastly differing tuition fees within the institution; the Bangla medium section is usually cheaper. Since this information is widely known, in addition to the differences in uniform, location of classrooms, teachers, etc., it is easy to separate and discriminate. English medium schooling has always been a privilege for the wealthy minority, engrained in the country's sociological history. The demand for English medium school for the children of wealthy families and nouveau riche led to the speedy creation of these schools in the private sector. Furthermore, it can be observed that those who have studied under English medium education have higher chances of applying to and attending universities abroad. This does not indicate that the Bangla medium students are any less interested, however, their chances decrease and they are also often discouraged from going abroad, due to their education's primary mode of language. In a society where a foreign degree (often no matter what type of university, known or not, vocational or unranked) gives an individual and their family a powerful social advantage, one can understand why the preference for English medium education has increased. In addition, the expanding private universities in the country that sometimes replace going abroad for higher studies are also like an extension of English-medium education, and therefore, “very elitist in their admission”, with their language entrance exams ten folds more expensive than public institutions, as discussed by Rahel Banu and Roland Sussex in “English in Bangladesh after Independence: Dynamics of Policy and Practice”. They further explained how elitism in education is expressed “not only in terms of the fees paid, but also in terms of the overall exclusiveness of the environment, not the least of which is the use of English in the classroom and whenever possible, outside the classroom” (Banu and Sussex, 131). However, it is not that the two sections may differ significantly in their lifestyle. They may be neighbours, their parents could be colleagues. The students from the two mediums will often listen to the same music, watch the same movies and television shows, recognise the same fashion, enjoy alike local hangouts, and may even come from analogous economic and family backgrounds. They will often identify with similar religious beliefs, cultural norms and political viewpoints. However, receiving an English-based education can crush these existing similarities between students of the same school, the same neighbourhood and the same city. There are many attitudes associated with defining the power of language. Using a specific language, such as English in Bangladesh can determine what one thinks the language can provide for him or her, and likewise, what others can think of the individual when the language is used. English, the language that has been associated with power and prestige (due to its legacy from colonialism) has become the suitable vocabulary in society. Whereas in India English has become the primary language of communication and politics and thus, people have become comfortable with its usage, this has now become the case concentrated only among Bangladeshi elites. Observing how school and college children interact with each other based on the language of education proves the capacity and influence of English in Bangladeshi society. English has diffused deeply in the country, resulting in the use of several varieties of the language in Bangladesh. “Banglish”, as popularly termed today, is the use of English diction inserted randomly in the Bangla dialogue. This can make a conversation as much as 30% to 40% in English. The use of Banglish is especially popular in media today, such as in television and private radio stations such as Radio Foorti. Hosts of public events and concerts are often specifically asked to speak Banglish. The development of Banglish is connected with historical and social factors, having its own function, context and usage. Banglish's popularity has likewise raised questions concerning identity and its realistic usage in a non-native English surrounding. Rifaiyat Mahbub, an alum of Sunbeams in Uttara explained how learning both Bangla and English is reducing the authenticity of each of those languages today. Further, the improper development of English education itself has complicated this problem. “Our English isn't good, but then we are focusing on learning English and so, our Bangla is not so great either. So, we talk in a mix where we use both English and Bangla words together, like Spanglish,” she explained. “Many don't like this in our society, causing a disconnect, especially because of the politics of Bangladesh that is engrained in our everyday lives,” Mahbub added. The prevalence of Banglish is important because language is deeply rooted in culture, and any cultural movements tend to bring broad changes to a community. There is an openly known notion that Banglish is creating a type of modernisation (or, Westernisation as is popularly paralleled in Bangladesh) that can be seen as threatening. Gerry Abbott from the University of Manchester in “Development, education, and English language teaching” (1990) explains how the need to develop through teaching a non-native language such as English “overshadows an arguably more basic need to transmit indigenous inherited cultures” and thus, because “development has been interpreted as 'becoming more like the West', western aid donors and cultural agencies [that work to promote English] have been accused of cultural imperialism” (Abbott, 174). The wide usage of Banglish or the purposeful usage of American or British-accented English by today's generation (who may have never even lived abroad) can often be seen by others as limiting and threatening. However, today's generation can argue that such usage is their homage to trying to get the country to develop and modernise. Languages, native and Western, can even have the capability of excavating generation gaps. In 2010, the General Administration of Press and Publication in China banned the use of English in Chinese media such as books, papers and on the web, explaining that the ever increasing usage of English and half-English phrases are damaging the “purity “of the Chinese language and upsetting the nation's “harmonious and healthy cultural environment”. It must be noted that the Chinese government also lowered the age for compulsory English from 11 to nine in 2001 and English teaching has emerged as a booming private business. Even in Bangladesh, the demand for English correlated with personal advancement and job placement has created a profitable market for coaching centres that exist in every turn. In Asia, the use of English is astounding; India houses one of the largest English-using populations in the world. English literature is increasingly becoming recognised as part of education, as well as policy making in many nations in the region. The escalating use of English, as well as the purposeful build up of educational institutions promising English, along with the language's firm grip on defining social elites in Bangladesh certainly asserts the language's overwhelming power. The authority of language goes beyond its linguistics; its place in history, sociology of the population, politics and economics must be considered. In Bangladesh, English is also connected with social hierarchies and power, going beyond just a linguistic divide. The language can be used to persuade entities, used as a code to get things and suppress and or elevate groups. It entitles some to things that others can never have. English has come to represent modernisation and development, whether that is right or wrong in Bangladesh, and native children learn this as soon as their first day in school.